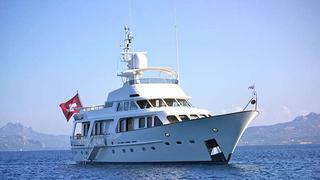 Jeroen van der Vliet at Van der Vliet Quality Yachts tells me he's listed the 25.7 metre motor yacht Lady Maya for sale. Built in steel and aluminium by Dutch yard Moonen to a design by Diana Yacht Design, Lady Maya was delivered in 1989 as the third in a series of six long range cruisers from the yard and was most recently refitted in 2012. As one of Moonen’s “pocket superyachts” she has a reputation for seaworthiness, comfort and safety. Lady Maya has cruised extensively throughout all areas of the Mediterranean, in all conditions, and the owner has spared no expense on her upkeep and improvements. She provides comfortable cruising for six guests in a master suite and two guest cabins, each with a Pullman berth. The large separate dining room forward enables guests to dine in intimate comfort while the main saloon aft comes with an L-shaped sofa for six, a built in desk, cupboards and bookshelves. The flybridge steering position provides panoramic views and has a grill and bar making for excellent al fresco dining under the stars. The aft deck offers a shaded area along with a table and chairs for more outdoor relaxation and with the side boarding ladder has easy access to the water or tender. Lady Maya's practical, spacious layout also provides an entirely separate crew area with two crew cabins and a crew mess. Twin 409hp Mercedes engines give her a range of 2,100 nautical miles at 9 knots. Lying in Italy, Lady Maya is asking €1,975,000.